Despite arms and military goods being subject to an international embargo for decades, Iran still has a steady output of new prototypes and military goods. T-72 Khorramshahr tank, the most advanced Iranian tank to date? Pretty much every locally made weapon system is based on foreign technology, which has been reverse engineered as good as possible. 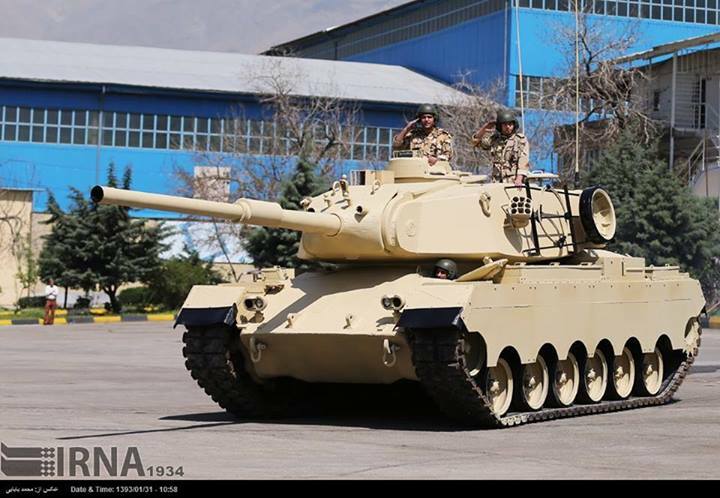 Iran has created three prototype versions of the Zulfiqar (Zolfaqar) main battle tank (MBT) based on technology from the M47/M48/M60 Patton tanks and the Soviet T-72M1/S MBT. It is unknown if and to which extend the Zulfiqars have actually entered service. The rare Khorramshahr tank (only one prototype?) is probably still the best Iranian tank, mating the welded turret of a T-80UD/T-84 including Kontakt-5 reactive armor with a T-72S hull. In 2014 the Iranian Army revealed the Sabalan tank prototype, an improved version of the M47 Patton tank. Unlike the original Patton, the Sabalan uses a welded turret fitted with a local version of the rifled 105 mm British L7 tank gun. The frontal hull armor is also welded and the bow machine gun (MG) has been eliminated. Thin steel skirts were added over the tracks, providing additional protection against MG, autocannon and RPG fire. The Sabalan seems to feature a rather advanced fire control system (FCS) for Iranian standards, it seems to be identical to that of the Zulfiqar 1 prototype tank. The Zulfiqar 1 is fitted with the EFCS-3 FCS from the Slovenian company Fotona. This computerized system allows accurate firing on the move and featurs a laser rangefinder, "second generation" nights sights and an independent sight for the tank commander, which is fitted to the commander's cupola. Based on the Sabalan hull, the new Tiam (or Teeiam) main battle tank was revealed in 2016. The Tiam however differs in a number of points compared to the previous Sabalan: the hull has received larger sponsons, reducing the driver's vision to the left side at least. A new turret (apparently a version of the T-55/Type 59 turret) has been fitted, which is also armed with a L7 gun copy. However the sights locations have been altered and the fire control system might be different, but this is not confirmed yet. However the Tiam features an (infrared) searchlight. The Tiam is fitted with Kontakt-1 explosive reactive armor (ERA) or a local copy of it. The ERA is fitted to the turret front, sides and roof aswell as the hull front and among a small sponson section at the hull sides. As Kontakt-1 and derivates do not provide any sort of protection against kinetic energy penetrators such as APDS and APFSDS ammunition, the overall protection level against AP(FS)DS should not be higher than that of a T-55. Kontakt-1 also does not protect against HEAT missiles with tandem charge warheads. It's intereting to see wether the Tiam will end a single prototype like the Sabalan or enter service in a bigger number. Compared to the M47 it's quite an upgrade, but compared to modern vehicles it's mostly 30 years outdated technology.